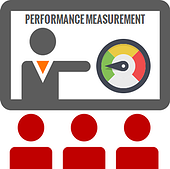 Performance Measurement (PM) is generally defined as regular measurement of outcomes and results, which generates reliable data on the efficiency and effectiveness of programs. Where to Start and How to Define Them? How Many Measures To Define? This training course covers an introduction to PM, core approaches and methodologies that can help establish and successfully manage your PM framework. The course includes same topics as PM Express course, offering more detail on each topic with workshops and exercises on how to define performance measure, review sample best practice measures, create data collection templates, and other PM elements.